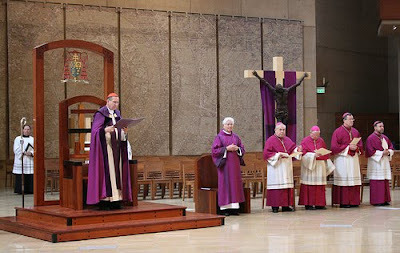 As our friends out West are well aware, today is Cardinal Roger Mahony's 74th birthday... and at this hour, the curtain formally rises on the most significant Stateside transition of B16's pontificate as a prayer for Mahony's successor debuts at this weekend's Masses in the 288 parishes of the nation's largest local church. Given the impact the pontiff's impending selection of an LA coadjutor will have far beyond the 5 million-member SoCal fold, the prayer -- to be used liturgically until the appointment -- is one worth keeping in mind well outside the archdiocese's three counties. Lord God, you are our eternal shepherd and guide. In your mercy, grant to the Archdiocese of Los Angeles a shepherd who will walk in your ways and whose watchful care will bring us your blessing. In your love for us, give us the joy of receiving a shepherd who will be an example of goodness to your people and who will fill our hearts and minds with the truth of the gospel. LA might be the mother of 'em all... still, it's far from the only major Stateside opening en route. With the holders of three cardinalatial sees reaching the retirement age of 75 over the next two years, and a staggering half of the nation's 12 cardinal-electors turning 80 -- and, ergo, losing their conclave rights -- within the same time-frame, the top rank of the 68 million-member US church is soon to undergo a clip of moves that, as one Vatican aide recently put it, will bring about "the greatest change we'll see in our lives."